If you’ve hit your cooking plateau and are in need of some inspiration in the kitchen for the darker nights of autumn ahead, Q&C is here to help. We’ve enlisted acclaimed chef and international foodie Alan Rosenthal to make the chore of uninspired nightly cooking a thing of the past. Alan Rosenthal is an acclaimed chef, food consultant, teacher and self-proclaimed ‘lifelong foodie’. He has travelled the world teaching cookery and working as a private chef, along the way acquiring the apparently oxymoronic moniker of "the English boy who can cook"! Alan is the man behind the stew revolution, having developed Stewed! in 2007, having had a stew-reka moment on the Circle Line when he realised that there was a gap in the market between ready meal and soup. He cut his ‘posh nosh’ teeth in Michelin starred Chez Bruce and Pied à Terre and at Providores, and was soon selling his first pot of premium stew on Alexandra Palace farmers’ market in North London. He regularly teaches at Leith’s School of Food and Wine. Alan’s unpretentious and delicious recipes have been regularly published by the national press, and The Times has hailed him as one of “the UK’s top foodies”. He’s a regular on the cookery demo circuit, and is regularly used by the broadcast media for his charismatic, relaxed and knowledgeable manner, appearing, for example, as a guest judge on the Good Food Channel’s cookery show, Perfect. 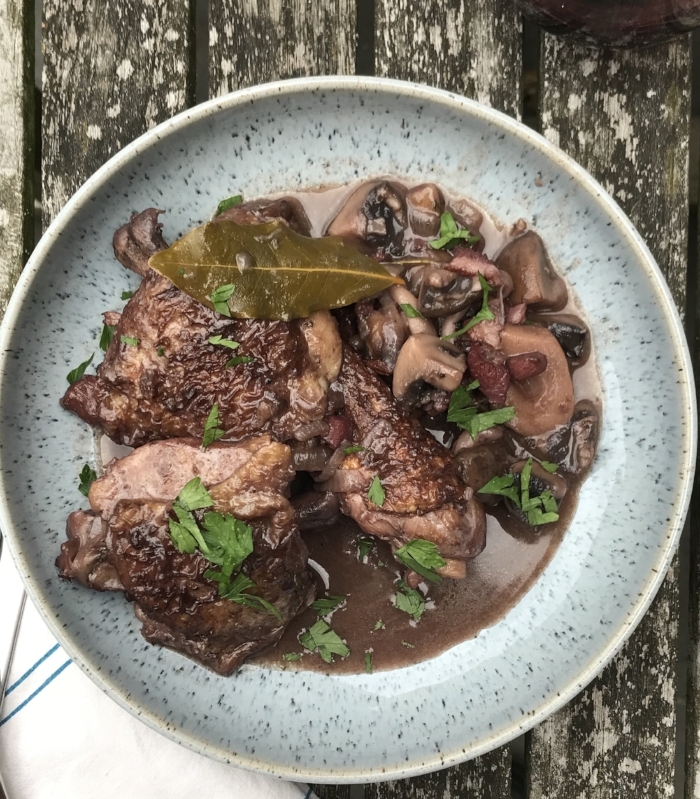 And now we welcome Alan to the Queen and Country magazine team with his regular column - starting this week with his superb coq au vin recipe. No longer will Q&C readers have the excuse of being uninspired in the kitchen. I’ve always loved to cook. Creating something delicious for others to eat is a great pleasure of mine. Food brings people together and builds relationships and since I love making people happy, I guess it’s only natural that I love cooking! I enjoy thinking about flavours and textures and how they work together, creating combinations that will inspire and delight. I’m not into overly engineered food; my flavours are gutsy and rustic, allowing the food and ingredients to do the talking rather than the way the food is presented. Over the coming months I’m going to be bringing Q&C readers some fantastic recipes, often nodding to the seasons. Some might be more complicated than others but the majority will be simple and delicious recipes that will deliver some great flavours to your table. Hopefully you’ll learn some new tricks and techniques along the way and feel inclined to give many of them a go at home. I’d love for you to get in touch with any requests for types of recipes that you’d like to see in the future too, so feel free to drop me a line. and braises to get us through the less clement weather. My first recipe for Q&C is a cheat’s coq au vin. As a rule, coq au vin is made with whole shallots and mushrooms that are browned before being added. But this can be a tad labourious so I’ve gone for a slightly easier method for you here. supermarket. I prefer using these to the cubes and jellies because they have no added salt. you add; remember you can always add salt but you can never take it away. Serve the chicken and sauce with some mash or boiled potatoes and some greens of your choice. And, if you can’t eat the whole lot in one sitting, then it freezes well. turn brown. Remove the lardons with a slotted spoon and reserve on a plate for later. pieces in the pan at once will create too much steam and the chicken won’t brown). the skin side has browned, flip the pieces over and cook the other side for a couple of minutes. Transfer to the plate with your cooked lardons. Serve sprinkled with chopped parsley, and enjoy!